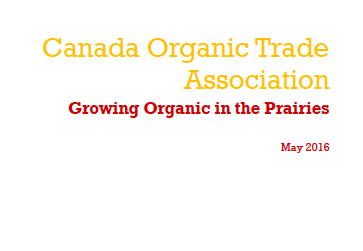 Canadian Organic Trade Associations had released new data on organic production on the prairies. This report is based on the 2014 data collected by organic certifying bodies and subsequently provided to the Canada Organic Trade Association for analysis. The Prairies are the organic breadbasket of Canada; 89% of all organic wheat and oat, as well as 85% of the rye grown in Canada are from Alberta, Saskatchewan, and Manitoba. In Canada, 99% of organic protein crops are grown in the Prairies; making this region one of the top world producers. Protein crops include pinto beans, dried legumes, dried beans, dried green beans, dried fava beans, chickpeas, chickling vetch, and others. 2016 is the international year of pulses! The Prairies collectively rank amongst the top 5 producers of organic pulses in the world, right behind France and Spain. Pulses include lentils, legumes, peas, and others. In 2014, there was important growth in the number of primary producers in the Prairies; Saskatchewan led the way with 78 new organic operations, followed by Alberta with 42 new organic operations and Manitoba with 10 newly certified primary producers. Organic operators in the Prairies are diversifying their activities; there are more organic producers that also are processing, handling or distributing their commodities. While Saskatchewan has 22% of the total number of primary producers in Canada, more than 36% of overall organic acreage in Canada. While Alberta has almost 8% of the total number of primary producers in Canada, they account for more than 18% of overall organic acreage in Canada.